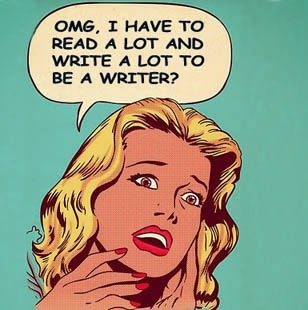 For years I had a sign over my desk that read WRITERS ARE PEOPLE WHO WRITE. It wasn't that I was linguistically challenged and required help defining the word "Writers." No, I admit to being a world class procrastinator, and the sign was a not so subtle reminder that unless I was actually writing I wasn't a writer, just a person with a wannabe writer. Sure, I could talk a good game about what I was planning to write, or convince myself I was in the research phase of my next book while I was reading or watching the squirrels frolic beneath the bird feeder. But unless I was writing, I was only a person who wanted to write. Mystery novelist Elizabeth George may have said it best when she ascribed her success to "bum glue," the ability to keep your bum in the chair and write. Now that my bum is in the chair, I think I'd like to get on with writing this post. Journalist and children's book author Stephen Kindland is the guest speaker at the April 14 meeting of the River City Writers. They'll gather at the SE Branch Library at 7:00 p.m. to hear Stephen share his experiences as a self-published author, providing specifics about the costs and pitfalls of hiring a publishing company versus the benefits of using a free self-publishing service. Contact Gregg Golson for more information. If you've ever been asked "Where do you get your story ideas?" then you'll want to hear what Michael Ray FitzGerald has to say on the subject. FitzGerald will speak at the April 15 meeting of Clay County Writers, 6:15 p.m. at the Orange Park Library, on the topic, "Spotting Good Story Ideas: They're Probably Right in Front of You." FitzGerald has written hundreds of articles for business journals and other publications on the topics of music, film and culture. Group leader Maureen Jung has more details. Writers by the Sea meet Thursday, April 16 at the Amelia Island Museum of History on 3rd Street in downtown Fernandina Beach. A social time starts at 6:00 with the meeting beginning at 6:30 p.m. Area thriller writer Chuck Barrett will speak on the topic of "Publishing Alternatives: What is Print-On-Demand?" A number of small support/critique groups will meet following the presentation. In what may be a first, having four FWA meetings in one week, the Ancient City Writers chapter meets on Saturday, April 18, 10:00 a.m. at St. Augustine's Main Library (corner of US 1 and San Carlos). Rik Feeney talks titles in this presentation he calls "Great Book Titles: Make Them Marketable and Memorable." Rik will tell us why your title is so important, and how to test its Internet impact. POSTPONED TO SATURDAY, MAY 2ND As though to prove you can't get enough of a good thing, Rik Feeney makes a return visit to the Ponte Vedra Writers meeting on Saturday, MAY 2. Come to the Ponte Vedra Library for the 10:30 a.m. meeting to hear Rik ask the burning question, "Audio Books — Have You Heard the Latest?" Rik will share the benefits of adding audiobooks to your product line, and how to do it yourself or even have a pro do it for nothing. Contact Vic DiGenti for more information about this meeting. The Jax Youth Writers meet on the first and third Thursdays of the month, 7:00 p.m. at the SE Branch Library. Kimberly Smith has the details. The Nassau County Youth Writers also meet the first and third Thursdays of the month at the Peck Center in Fernandina Beach at 4:45 p.m. Contact Jim Weinsier for more information. FWA's 4th Annual Writer's Nest Mini-Conference is set for Saturday, April 25 at the Hilton Orlando/Altamonte Springs. Workshops will cover screenwriting, writing the YA novel, POV, and taking your writing to the next level, among others. Click here for all the details. April 30 is the deadline for both the FWA Collection and FWA Youth Collection. The 2015 Adult Collection, Volume 7, comes with the theme "Revisions, Stories of Starting Over" and will include 60 short pieces written by FWA members. Your submission may take the form of fiction, non-fiction, or poetry. This year's Person of Renown, Marie Bostwick, will select her top ten favorites. The word limit is 1,200 words. Visit the webpage for all the entry guidelines. The FWA Youth Collection, Volume 2, has a similar theme of "Starting Over." Click here for entry guidelines. Submissions for the RPLA competitions close on May 15. Everything you ever wanted to know about this year's competition can be found right here. Calling all mystery writers! There's a new mystery writers group in St. Augustine called Murder Ink, and they're searching for new members. They meet on the first Thursday of each month, 5:30 p. m. at the St. Johns County's SE Branch Library on US 1 and SR 206. That's Thursday, April 2 this month. Contact Kurt McGill for more info. Florida Sisters in Crime meets Saturday, April 4 at 10:15 a.m. at the Jax SE Branch Library to hear Deputy Director Penelope Knox from the local branch of the U. S. Marshall's Service. Ms. Knox will explain the difference between reality and fiction as it pertains to the duties of the U. S. Marshall's Service. Lynn Harlin kicks off another in her series of Shanty Boat Writers Workshops that will meet each Saturday afternoon from April 11 to May 16. The workshops are for both beginning and more seasoned writers, and run from 12:00 noon to 3:00 p.m. Contact Lynn for more info. Nancy Quatrano, editor, author, writing coach, has put out double call for short story entries. The first is for Christmas stories to be included in Snowbird Christmas, Volume 3. Word count from 1,000 to 3,000 words, and stories may be either fiction or non-fiction, but must be heart warming and G rated. Deadline is April 18. The second call is for mysteries set on the East Coast, any state that touches the Atlantic Ocean. Word count from 1,500 to 3,500, and submission between June 10 and July 10. There is no entry fee. Contact Nancy at ontargetwords@gmail.com for more details. Congratulations to Holly Bebernitz on the publication of Road to Briarwood, part two of the Magnolia Arms Chronicles. Holly will have a book launch party at Heavenly Chocolate Creations, 4251 Lenox Avenue, on Saturday, April 25 from 10:00 a.m. to 12:00 p.m. Sounds tasty. And that's all the news for the month of April, 2015. 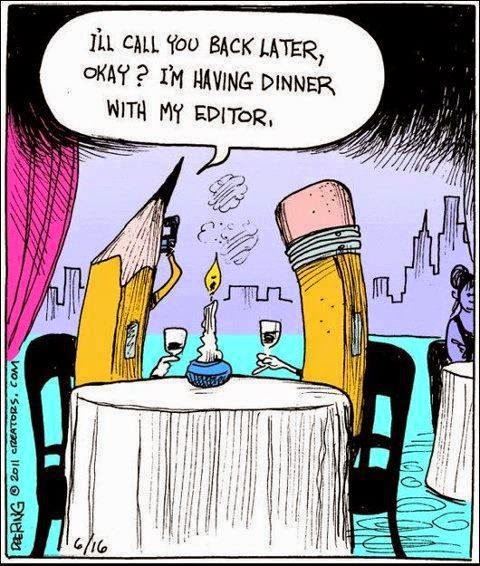 Remember, Writers are people who write. "An artist is always out of step with his time. He has to be." It struck me that every time a book makes waves, thousands of writers try to ride the same wave, hoping to cash in on the flavor of the month. It happened with Dan Brown's The Da Vinci Code, and most recently with Fifty Shades of Grey. But as Orson Welles reminds us, we need to create our own waves and not march in lockstep. Find your own voice and maybe others will be emulating your success. Sermon over. Time to march on with the calendar of outstanding events this month ... and more. The Jax Youth Writers meet on the first and third Thursdays of the month, 7:00 p.m. at the SE Branch Library. Kimberly Smith has more information. And in Fernandina Beach, the Nassau County Youth Writers also meet on the first and third Thursdays at the Peck Center at 4:45 p.m. Contact Jim Weinsier for details. River City Writers meet on Tuesday, March 10 at the SE Branch Library off Gate Parkway. The meeting starts at 7:00 p.m. and the guest speaker is screenwriter Kelly Fogwell. Her topic is "How to Use Screenwriting Techniques to Strengthen Fiction Writing." Kelly has taught screenwriting at the college level, and has some great tips for writers of fiction. Contact Gregg Golson for more information. Clay County Writers meet on Wednesday, March 18, 6:15 p.m. at the Orange Park Library, 2054 Plainfield Avenue. Group leader Maureen Jung has the details. Writers by the Sea will gather on Thursday, March 19, 6:30 p.m. at the Amelia Island Museum of History in Fernandina Beach. Barbara Bond will present "The Writing Guide for the 21st Century: Do You Need It?" Novelist Arliss Ryan takes the spotlight for the Ancient City Writers meeting on Saturday, March 21, 10:00 a.m. at St. Augustine's Main Library. Arliss will share her secrets for turning historical research into astounding fiction no reader can resist. A visit to the Ponte Vedra Library on Saturday, March 28 at 10:30 a.m. will bring you to the Ponte Vedra Writers meeting. We welcome editor, writer, and writing coach Mary Ann de Stefano speaking on "From First to Final Draft: Opening the Door." Mary Ann, who edits FWA's official magazine, The Florida Writer, will talk about the various stages of manuscript development, when to go it alone, and when to share your work in progress. FWA's next mini-conference is on Saturday, March 21 in Plantation, FL in S. Florida. The dual theme of the conference is building suspense and writing female characters. Here's the link for more information. I'm presenting a new workshop on writing thrillers in the morning, and will join Jade Kerrion and Kim Campbell in the afternoon to answer a few questions about how I approach writing my female characters (very carefully). This should be a good one if you'd like to make a weekend of it in sunny S. Florida. The Royal Palm Literary Awards competition is open for submissions through May 15. The deadline for early bird fees was last Saturday, so you (and I) will now pay $40 per entry rather than $30. Still, that's better than $60 per entry fee which kicks in on May 1st. Florida Sisters in Crime meets on Saturday, March 7, 10:15 a.m. at the SE Branch Library, to hear from an arson investigator from the Florida Bureau of Fire and Arson Investigators. NY Times bestselling author Steve Berry will debut his new thriller, The Patriot Game at a fundraiser for the St. Augustine Historical Society Research Library on Thursday, March 26. A reception will precede Steve's presentation and Q & A session, followed by a booksigning. The event takes place from 6:00 to 8:00 p.m. and tickets are $100 per person, which includes a copy of the book. Contact Bob Nawrocki at 904-825-2333 for more information. Ancient City Romance Writers welcome Salt Run Publishing's Kellie Sharpe as their speaker to their Saturday, March 28 meeting. She will present, "Marketing & Promotion for Authors Who Break Out in a Cold Sweat." The meeting is at 1:00 p.m. at the South Mandarin Branch Library. Laura Hampton of The St. Augustine Record is looking for a few good freelancers. She's particularly interested in articles on food, health and wellness, gardening and outdoor living, local residents and local charitable organizations and/or religion. If interested, contact Laura at laura.hampton@staugustine.com. From time to time I'm asked when I'm going to present my Novel in a Day workshop again in our area. It's been more than a year since my last one in Jacksonville, but now I've teamed up with the Florida Heritage Book Festival & Writers Conference to present one as a benefit for the organization. The date is Saturday, May 9 at the Gamache-Koger Student Center at Flagler College. Registration is $89 through April 20, $95 from April 21 to May 1, and $115 at the door. The fee includes a box lunch and a 30-page workbook. Click here for information and registration. And that's all the news that fits. Don't forget to march to the beat of your own drummer.